A England "Crown of Thistles"
Hey-o! I hope everyone had a fun Halloween. If you follow me on Instagram you might have seen my photo collage of my mermaid costume and nails. 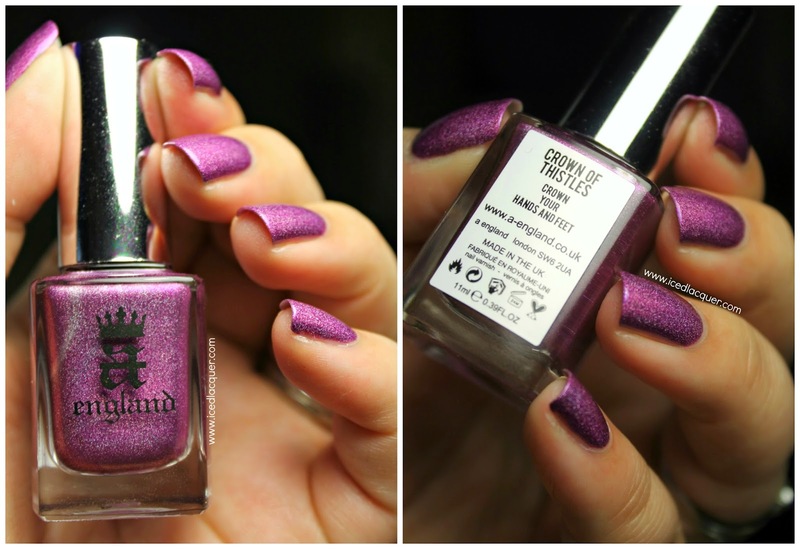 ;) Today I have a purple polish to show you that has quickly skyrocketed its way into my heart and onto my "Favorite Purples Ever" list. "Crown of Thistles" - This warm magenta-purple is filled with scattered holographic particles and has a bit of a violet color shift that happens at certain angles. As I've come to expect with A England polishes the formula was an absolute dream and this was almost a one-coater. These photos show two coats plus top coat. I was wondering how it would compare to other A England shades so I pulled out my collection. The closest one I have is "Lady of the Lake" which is pictured on the left above. In comparison, "Crown of Thistles" looks SO pink! From left to right here are the names: "Briar Rose," "Tristram Eyes/Princess Sabra," "Dragon," "Saint George," "Tristam," "Dancing With Nureyev," "Lady of the Lake," "Crown of Thistles," "Princess Tears," "Ascalon," and "Bridal Veil." 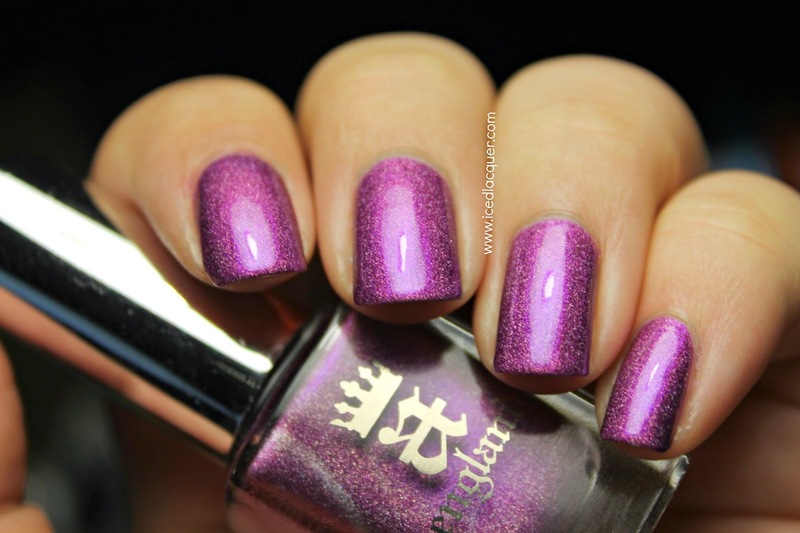 You can purchase A England shades from several online locations, but I usually get mine from Llarowe or Color4Nails. Thanks for reading! DAMMIT TIA. I'm going to have to stop reading your blog. You make my wishlist grow every time you post. You made this look oh so beautiful!